Apartment living has unique challenges that offer plenty of opportunity to get creative with your interior design. Limited space doesn’t have to limit your style. No matter your preferred decor, creating an apartment that welcomes you home every day can be fun and easy when you learn to make the most of the space you’ve got. Smaller Scale Pieces – right size your space with apartment sofas and settees, offering smaller proportions that standard sofas these stylish pieces fit well into tight quarters. 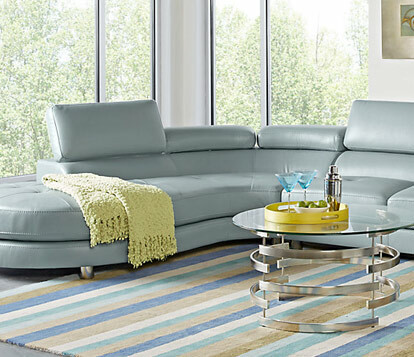 Sectional Sofas – providing more seats while monopolizing less of your floor plan, sectionals are a great option for apartments. 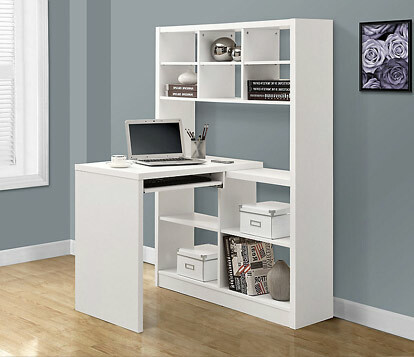 Pay careful attention to the configuration that will fit your space best. 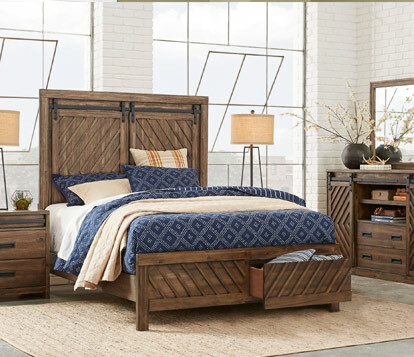 If you are looking for ultimate versatility, make it a sleeper. 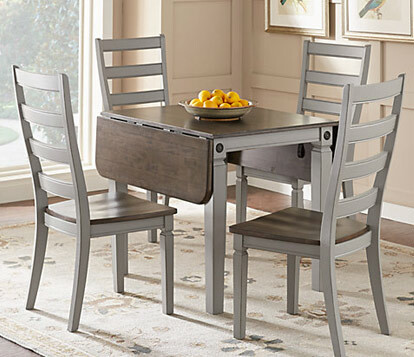 Double Duty Furnishings – tables that nest with servers or do double duty as both dining room and a home office work station help you make the most of any space-challenged apartment. 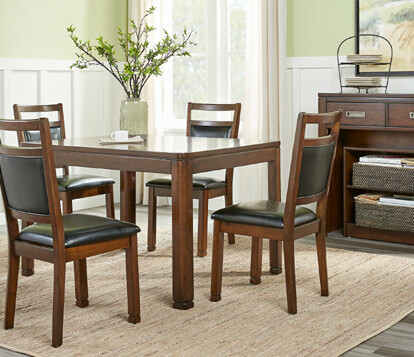 Unique Dining Options – Smaller dining areas provide the opportunity for creative solutions. 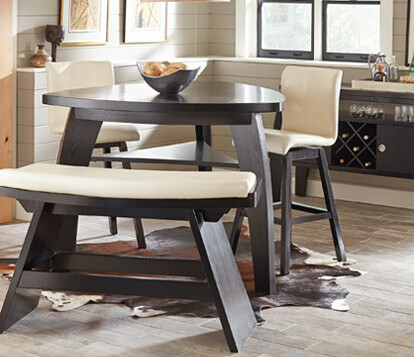 Look at rounded corners, distinctive shapes and counter height dining tables; these tricks visually expand your room and keep your space looking stylish and spacious. Room Dividers and Shelves – make the most of apartment spaces by going vertical. Shelving, bookcases and room dividers will give you a place to store items and display keepsakes without taking up much floor space. Dividers and screens can help separate areas in your home when you are looking to add privacy or remove distractions. Pro Tip: baskets, bins and boxes work well on lower shelves to disguise clutter and store items. Coordinated Rooms – when dining and living spaces are within eye-shot, coordinating the style and color scheme between the two spaces is important. While the pieces don’t have to be perfectly matched, finding furniture with similar lines and tones gives your apartment a cohesive look. 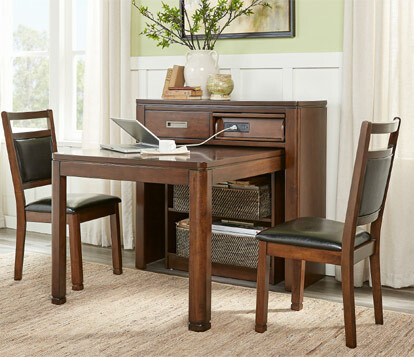 Work Smart – corner desks, closing armoire desks and bookcase desks add valuable workspace and storage to your apartment home. 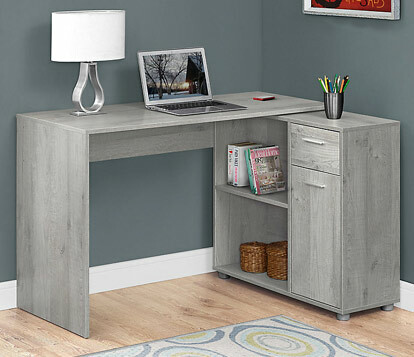 By making the most of your wall space, versatile home office solutions help you fit all of the functionality you need into your floor plan. 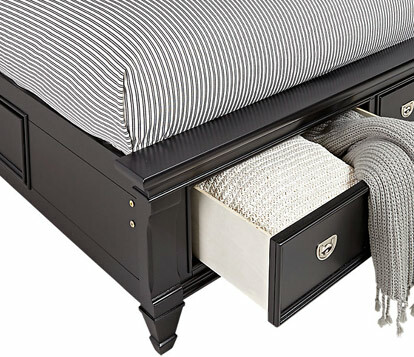 Space Savvy Bedrooms – there are many stylish options available that take advantage of underbed space with storage drawers built into the bed frame. Storage beds can be found in all sizes: king, queen, full and twin. 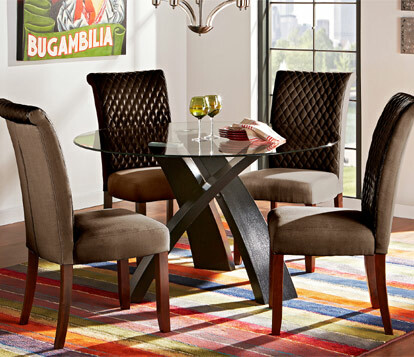 Storage Cocktail Tables and Ottomans – look for living room tables that offer flexibility. 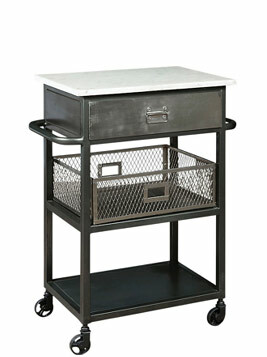 Lift-top cocktail tables offer convineince of a raised surface for working on your laptop or grabbing a casual meal, many offer under-lid storage as well. 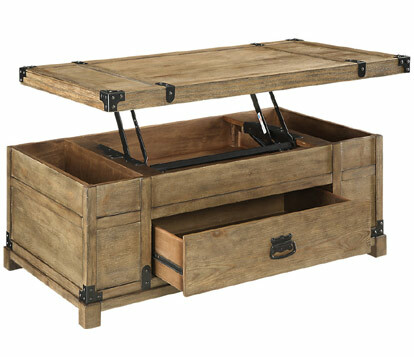 Storage tables offer drawers or shelving for keeping books, magazines, games or other household items handy yet tucked away. 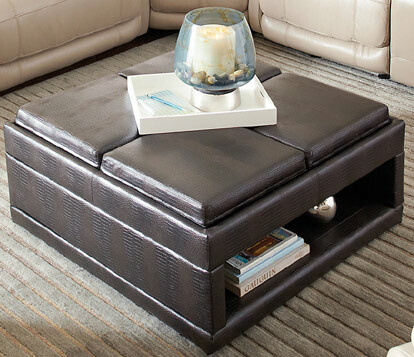 And cocktail ottomans are available as a table surface, a comfy place to prop up your feet or instant additional seating when you are entertaining guests. 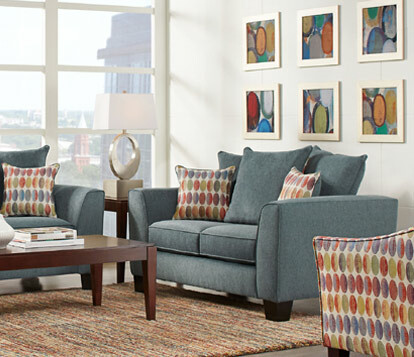 Add Color and Pattern – apartments tend to have neutrally colored walls and flooring. Some apartment complexes will allow you to paint your walls a different color but many do not. 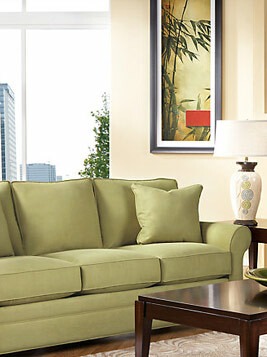 Add personal style to neutral spaces with colorful wall art and area rugs. 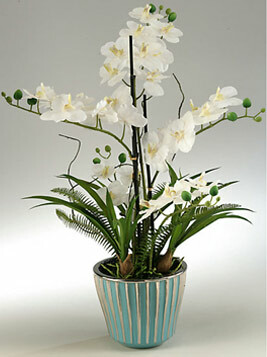 Bring the Green Indoors – Set in lofty heights and without a yard to ground them, apartments can feel disconnected. Add life and vibrancy to your apartment with nature-inspired decor. 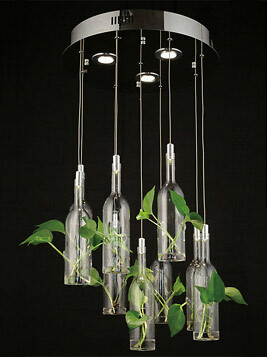 Live and silk potted plants, tropical upholstery designs, nature-inspired wall art or something as unique as a living chandelier can establish a connection to nature; adding a soothing quality to your apartment. 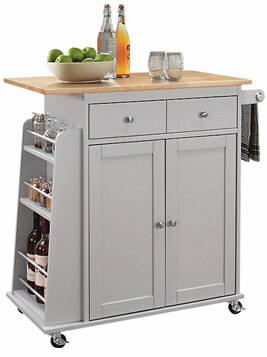 Keep Things Mobile – Kitchen carts, office carts and bar carts all offer stylish and valuable storage space that provides added versatility for an apartment home. Clipped Corners and Rounded Edges – in seating, rugs, tables and ottomans, adding curves break up the boxy feel of an apartment space. Plus, rounded corners ease movement around tightly grouped furniture pieces while occupying less space to let the room breathe. 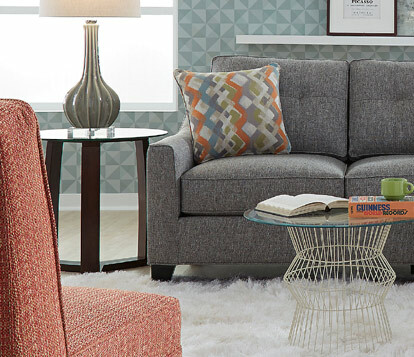 Versatile Space Savers – when every square inch of floor space matters, make every piece count. Daybeds function as seating by day and as a bed at night, plus many have a trundle which can house an extra twin size mattress or offer loads of hidden storage. 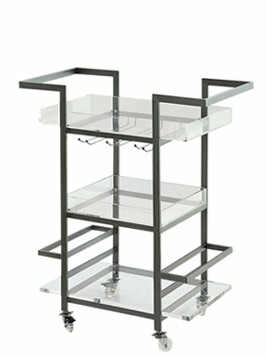 A corner shelving unit turns any unused corner into a functional storage or display resource. Slipcovers and Eclectic Additions – Short on budget? Slipcovers can unify disparate furnishings while eclectic accessories can offer a relaxed, unfussy and welcoming feel to your space that sets the stage for a room where disparate pieces have a curated feel and to make sense together. Looking for more ideas on apartment living? 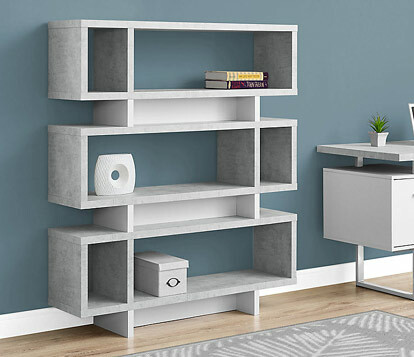 Check out these articles –Furnishings that Transition from an Apartment to a House, Storage Suggestions for Every Room and 3 Furniture Tips for Small Scale Living.